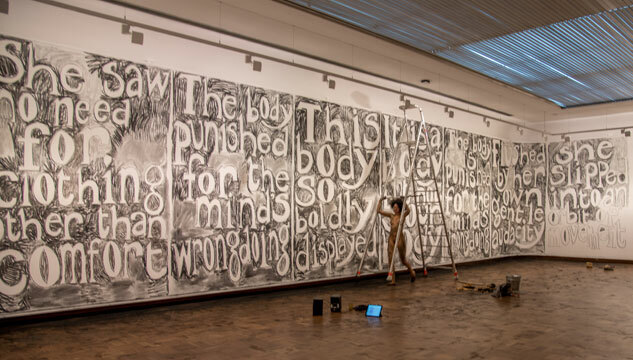 Castlefield Gallery is excited to welcome artist Jade Montserrat to Manchester to talk about her practice that crosses drawing, painting, performance, film, and text. Programmed as part of Castlefield Gallery’s CG Associates series of monthly events, we are pleased to be able to open up a limited number of places for this event up to the public. Montserrat works at the intersection of art and activism, interrogating these mediums with the aim to expose gaps in our visual and linguistic habits. Her talk will cover recurring themes in her work such as the necessity of decolonisation, the notion of Affectionate Movement, ecologies of care, and the demands placed on bodies within and outside the performance space. Jade Montserrat lives and works in Scarborough, North Yorkshire and is the Stuart Hall Foundation practice-based PhD candidate at The Institute for Black Atlantic Research, The University of Central Lancashire (2017-). She graduated from the Courtauld Institute of Art in 2003 and Norwich University of the Arts in 2010. Recent selected screenings, performances and presentations include: Arnolfini, and Spike Island, Bristol (2017), Alison Jacques Gallery (2017) and Princeton University (2016). Montserrat works collaboratively with artist and performance collectives including Network 11, Press Room, the Conway Cohort, Rainbow Tribe: Affectionate Movement and Ecology of Care. She is the recipient of the Jerwood Drawing Prize student award (2017).